Tau Beta Pi wishes to thank our many donors who make our programs possible. Your support means a lot to us and is essential to the work we do in equipping the next generation of young engineers with the professional, leadership, and personal growth opportunities to make a positive impact on our world. Below are the stories of some of our alumni who have made gifts of cash, pledges, deferred gifts (estate planning), and applied for matching gifts from their employers to fund Tau Beta Pi's student scholarships, our Chapter Endowment Initiative, and the annual fund. 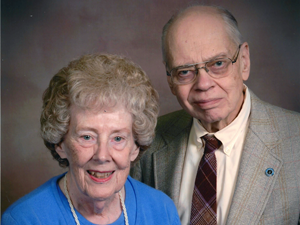 James S. Aagaard, Ph.D., Illinois Gamma '53, and Mary-Lou Aagaard, As an undergraduate at Northwestern University, Dr. Aagaard became a member of Tau Beta Pi and co-president during his senior year. He continued on at Northwestern for graduate work becoming a faculty member in 1957 and then a faculty adviser to the chapter. He is now Professor Emeritus of electrical engineering and computer science. Jim became involved at the national level as assistant editor of what was then the Council Bulletin, where his primary duty was to tabulate the results (with the invaluable help of his wife, Mary-Lou) of the annual chapter survey and then write an article for The Bulletin. Jim was always impressed by the number, variety, and ingenuity of chapter projects that supported the chapter's school and its community. Jim served as Convention photographer for several years and received a distinguished service award from Tau Beta Pi in 1974. Since their marriage (attended by Bob Nagel), they have been pleased to provide annual support to Tau Beta Pi and have long been admirers of the Scholarship/Fellowship Program. Jim and Mary-Lou have provided a bequest in their estate planning which Jim notes, "Should provide a yearly income to Tau Beta Pi that is many times what we have been able to give in the past." 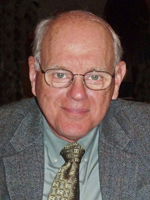 James A. Anderson, Michigan Epsilon '66, Attended Wayne State University completing his B.S.C.E. in 1966 and M.S.C.E. in 1970 and pursued a Ph.D. until starting his business in 1977. Today, he is president, CEO, and chairman of Urban Science, which applies problem-solving tools from engineering to data in the sales and marketing departments of, principally, automobile manufacturers. As a business owner as well as someone intimately involved in university fundraising and budget-balancing, Jim understands the importance of healthy endowments and laying the foundations for things to come. "Growth and taking on new projects is important, but you need to start with a solid base of operations if you want to reach your final destination. Tau Beta Pi provides outstanding support to engineering students. If we as a country want to develop leadership talent, we need to focus on the entrepreneurs and innovators of tomorrow." 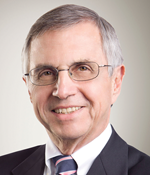 Paul E. Benneche, Virginia Alpha '74, Completed B.S. and M.S. degrees in nuclear engineering at the University of Virginia and spent his entire professional life at his alma mater serving in multiple positions from Reactor Operator to Reactor Director in the Department of Nuclear Engineering (1977-2006). As the Virginia Alpha Chapter has already been endowed at the level of $115,000, Paul stepped forward with a challenge match of $20,000 toward the endowments for the four other Virginia chapters of Tau Beta Pi that are not yet fully endowed. 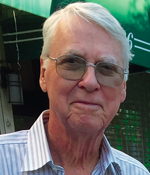 Robert Tolson, VA B '58, stepped forward to complete this challenge match for VA Beta. 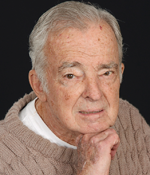 John W. Bolender, Wisconsin Alpha '51, Graduated with a bachelor's degree in mechanical engineering and joined the Boeing Company for a 38-year career as a mechanical designer. He was involved in the development of civilian and military aircraft, satellites, missiles, the International Space Station, and several classified programs. Included was a four-year military leave of absence as a U.S. Naval aviator. John is happily retired and resides in the Seattle, WA, area. Don A. Dechman, Texas Alpha '57, Long-time Tau Beta Pi member and volunteer, Dechman knows what it means to have a positive attitude and persevere when solving math problems as he has served as one of Tau Beta Pi's four Brain Ticklers judges since 1996. In honor of Don's 80th birthday, his three sons, David (VA B '82), Ken (MA D '87), and Jim (TX A '89), are endowing the Don A. Dechman Scholarship. Don notes, "Scholarships are important to helping young minds get started in life." Don received his bachelor's degree in chemical engineering from the University of Texas at Austin. Don spent the majority of his career at Union Carbide as a process engineer. In his time there he helped develop the Low Pressure Oxo Process to make butyl alcohol - a process which Union Carbide licensed and is used in the production of approximately 50% of the world's capacity of this chemical. He is currently retired full-time in Naples, FL, with Jonene, his wife since 1958. 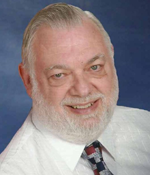 Nicholas M. Donofrio, NY Gamma '67, Long-time Tau Beta Pi member and volunteer, Dechman knows what it means to have a positive attitude and persevere when solving math problems as he has served as one of Tau Beta Pi's four Brain Ticklers judges since 1996. In honor of Don's 80th birthday, his three sons, David (VA B '82), Ken (MA D '87), and Jim (TX A '89), are endowing the Don A. Dechman Scholarship. Don notes, "Scholarships are important to helping young minds get started in life." William R. Goodin, Ph.D., California Epsilon '75, For more than 30 years, Dr. Goodin has worked at UCLA in both corporate and alumni relations. First, at UCLA Extension presenting technical courses for industry partners around the world, and later at the UCLA School of Engineering enhancing relationships among corporate partners, faculty, students, and alumni. Throughout his career he has also volunteered his time as a mentor and advisor for engineering student organizations at UCLA. He is a member of the Governing Board and past President of the UCLA Engineering Alumni Association (EAA), chair of the UCLA Computer Science Alumni Advisory Board, a member of the UCLA Electrical Engineering Alumni Advisory Board, and chair of the UCLA Mechanical and Aerospace Engineering Alumni Advisory Board. 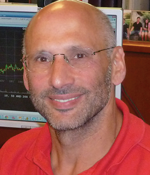 He is chief advisor for Tau Beta Pi at UCLA, and in 2011, received the McDonald Mentor Award from Tau Beta Pi for excellence in mentoring and advising. 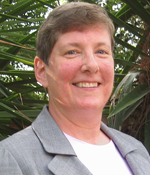 Dr. Goodin holds a BA in mathematics, MS in computer science, Ph.D. in mechanical engineering, and MEngr in engineering management. Lee A. Hennis, California Delta '65, Graduated in 1965 with a BS in aerospace engineering and joined Hughes Aircraft on their master's work/study fellowship program. He received an MS in aerospace engineering in 1967, was selected for a Hughes Business work/study fellowship in 1969, and received an MBA in 1971. All degrees were from the University of Southern California. Hennis was employed for 33 years at Hughes Space and Communications (HSC) until retirement in 1998. Twenty-eight of those years were in the spacecraft thermal control area, including 11 years as department/laboratory manager. The last five years at HSC were spent in systems engineering supporting proposals for commercial new business opportunities. His responsibilities included technical and fiscal estimates for systems engineering, integration, test launch operations, and mission/on-orbit activities. After a year off, Hennis was asked to return to Hughes (now Boeing Satellite Systems) as a part-time thermal control consultant. His primary functions were mentoring new employees and "trouble-shooting" and devising corrective actions for temperature control technical issues on Boeing satellites. He also supported launch and mission campaigns as a senior thermal advisor. This gift in support of the Chapter Endowment Initiative for CA Delta will hopefully make it a little easier for students to enjoy the benefits and activities of Tau Beta Pi. Les M. Holland, Jr., Illinois Alpha '66, Les was born and grew up in Southern Illinois and was a 4-H Club member for 10 years. He earned his bachelor's in electrical engineering from the University of Illinois. While at Illinois, he worked on ILLIAC-II (the world's fastest computer for 10 years) and PLATO (Programmed Logic for Automatic Teaching Operations, the world's first multi-user, computer-based teaching machine that continued in commercial use through 2005). Les worked at several Phoenix-area Motorola locations for 25 years in computer programming and engineering management where his specialty was the use of interactive computer graphics to solve complex problems. He selected, installed, and trained users on five generations of commercial interactive computer graphics systems and solved a number of complex, one-of-a-kind, engineering design problems from solo to lead a team of 10. His publications include: 1981 presentation at WESCON, Future Applications of A Full Capability Engineering Workstation; and 1985 publication in IEEE Micro. 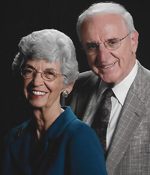 Les has been married to Dr. Marfa Lee Holland, Ed.D., since 1967 with 2 adult daughters. Franklin "Pitch" Johnson, California Gamma '50, Founder of Asset Management Company in Palo Alto, CA. His generous gift is in support of the California Gamma Chapter at Stanford University. This gift is in support of our Chapter Endowment Initiative, by which alumni, companies, and foundations can permanently endow the Association's activities that support any of our student chapters. While gifts of a minimum of $5,000 are being accepted for this effort, a gift of $100,000 is required to fully endow a chapter—and we are trying to reach this amount for CA Gamma. Pitch has generously stepped forward as the first person to support our chapter at Stanford University. While the first $5,000 of Pitch's $20,000 constitutes his gift toward this effort, the remaining $15,000 is a pledge that will be paid out in increments of $5,000 to match the next three gifts made by others who come forward with gifts of this minimum amount designated for CA Gamma. Harry W. Lange, Michigan Zeta '75, His involvement with Tau Beta Pi has spanned a good portion of his life, as he became an active member in his chapter attending the 1973 convention in Gainesville, FL, and then was the Co-Arrangements Chair in 1974 when his chapter hosted the annual convention in Flint, MI. Upon graduation with a degree in mechanical engineering, Harry worked as a senior structural engineer at General Motors and then attended Harvard Business School. Following graduating with his MBA, Harry began working at investment firms winding up his career at Fidelity as Manager of the Magellan Fund, one of the best-known funds in America. Harry continued his involvement with Tau Beta Pi attending conventions since 2009 and in the past several years has talked to students about investments and personal financial management as one of our professional development speakers. With several others, Harry participated in Tau Beta Pi's Vision Development Group which met from 2011-12 and has also been a member of the Trust Advisory Council since 2007. Harry endowed the Michigan Zeta Chapter of Tau Beta Pi at Kettering University to raise the level of awareness and importance of Tau Beta Pi at his alma mater and to help support chapter projects and encourage alumni to become more involved in the chapter. James M. McGrann, New York Alpha '84, Jim graduated in 1984 from Columbia University and joined Arthur Andersen in their management information consulting division. 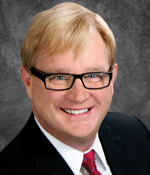 The second half of his career has been in the vision and eyewear industry, and in October 2015, Jim will take on the job of president and CEO of VSP Global. Jim notes that VSP Global was happy to step forward and endow the CA Upsilon Chapter at California State University, Sacramento. "I was president of my chapter and attended the 78th Convention at Urbana-Champaign, IL, in 1983. I also remember my chapter rallying around one of our friends who received a Tau Beta Pi fellowship. VSP Global is proud to support an organization that does so much to develop young engineering talent as they grow into our society's future leaders." 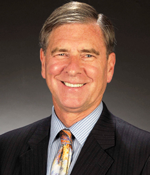 Jerry S. Rawls, Texas Beta '67, Jerry entered the engineering program at Texas Tech University and earned his B.S.M.E. in 1967 and went on to earn a master's in industrial administration from Purdue University in 1968. In 1988 Jerry and a partner formed their own fiber optics company, Finisar Corporation. In 1999, the company went public, and, in 2014, Finisar had revenues of $1.2 billion, employing 14,000 people. Jerry's current role is as executive chairman of the board. Jerry was honored to be invited as a member of the Association and notes, "Tau Bates have potential. They are very bright and can accomplish a lot." Regarding his gift he shares, "There's lots of things a chapter can do to provide service in the community and help to other students—having financial backing makes the chapter and the Association more productive." T. Richard Robe, Ph.D., P.E., Ohio Delta '55, is stepping forward with a challenge match of $20,000 toward the endowment for the Ohio Delta Chapter at Ohio University. Richard was the second Ohio Delta Chapter president in 1954-55 after its founding in 1953. A civil engineer and alumnus of Ohio University (BSCE in 1955 & MSME in 1962). He started his career with General Electric and then served as a supersonic jet fighter pilot in the U.S. Air Force. 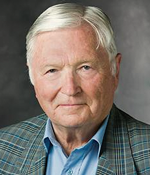 After teaching for 15 years at the University of Kentucky, he returned to Ohio University in 1980 as Dean of the Russ College of Engineering and Technology and later retired as Dean Emeritus in 1996 and then retired again as Director of the Robe Leadership Institute in 2004. Ralph A. Rockow, Ohio Gamma '58, and Barbara Rockow have shared a long history with The Ohio State University beginning with their graduation in 1958. Ralph earned B.S. and M.S. degrees in mechanical engineering and Barbara earned a B.S. in education. As Founder and President of Exodyne, Inc., Ralph currently oversees the operations of three wholly owned subsidiaries with a diversified range of product lines and approximately 500 employees. Over the years, Ralph has re-engaged with Tau Beta Pi through his service on the Vision Development Group which met from 2011-12 and through his and Barbara's attendance at alumni gatherings held in Phoenix, AZ, in 2013 and 2014. At the 2013 Tau Beta Pi Convention held in Ames, IA, Ralph provided the keynote address at the final banquet. Ralph and Barbara support the Tau Beta Pi Association by providing monetary reserves for assisting engineering students to achieve their educational goals. With the Chapter Endowment Initiative, they are providing endowment funds so that students of the OH Gamma Chapter can attend the annual convention, receive officer leadership training through the District Program, obtain professional development through Engineering Futures, participate and facilitate MindSET activities, and conduct chapter-directed activities on their campus and in their local community. Renee Schoenborn, P.E., Wyoming Alpha '85, went to work for Shell Oil Company after she graduated from the University of Wyoming in December 1985. She initially worked as an instrument engineer in downstream manufacturing and eventually moved into capital project work. Her technical career took her overseas and abroad for 8 years while working on mega-projects, helping to build large LNG plants and other large-scale upstream and downstream units. She is now an Engineering Team Lead in Instrumentation, Automation, Process Control, and Optimization in Shell's central engineering group. Renee served as the President for the WY A Chapter in her senior year and was selected to go to the National Convention, held in Lehigh, PA in 1985, celebrating the Society's 100 year celebration. Being able to attend the Convention was an amazing event for Renee, allowing her to meet other TBP members and officers, and to hear excellent guest speakers. It truly left a big impression on her. Giving to the WY A Chapter Endowment will directly help other University of Wyoming students to attend Convention, allowing them to network, experience how the national organization operates, and have similar experiences that Renee had. Larry Simonson, Ph.D., P.E., South Dakota Alpha '69, As a faculty member for over three decades at the South Dakota School of Mines & Technology and Chief Advisor to the chapter there for almost as long, TBP has benefited greatly from Larry's involvement. 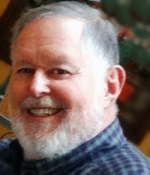 In recent years, Larry served as TBP President (2006-14). Following retirement from the classroom, he keeps in touch with SDSM&T alumni as a major gifts officer with the South Dakota School of Mines Foundation. 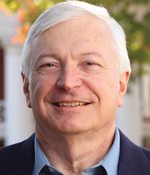 Larry's decision to fund a chapter endowment was influenced by his insider's view of TBP: "As president for the past eight years, I know there are tremendous opportunities for Tau Beta Pi to provide life-impacting activities for our members, but if we are going to keep moving forward, we need additional resources. I am hopeful that my gift will inspire others who have the resources to put the Association in a position to take on new projects." Larry's gift in support of SD Alpha was inspired by one of his former students, Shawn R. Schwaller. William F.H. Sinclar, Mississippi Alpha '63, Received his BSEE '63 and MSEE '67 from Mississippi State University and his MBA '77, from the University of Hawaii. Bill has fond memories of his time in Mississippi growing up on a farm and then heading to the university and being a part of ROTC. Bill's work with LTV (Ling/Temco/Vought) took him and his family to Honolulu for eight years and then back to the Dallas/ Ft. Worth area where he retired in 2001 from Northrop Grumman, which had acquired the LTV division for which he worked. Bill remains heavily involved with his local Rotary club and resides with his wife, Barbara, in Rockwall, TX. Bill stepped forward with a challenge match in support of our Mississippi Alpha Chapter at Mississippi State University. Robert E. Spitzer, Illinois Alpha '61, was able to attend some great universities and was inducted into Tau Beta Pi long ago. He is a retired Boeing Engineering VP (40 years). Some of his career included university relations. He remains a supporter of engineering education for all segments of our society. He chose to support Tau Beta PI as it recognizes young people from all walks of life in their pathway of engineering. Robert H. Tolson, Virginia Beta '58, earned his bachelor's and master's degrees from Virginia Tech and a Ph.D. in engineering mechanics from Old Dominion Univ. Bob's 37 year career at NASA LaRC included roles as researcher, branch heads, and the LaRC Chief Scientist. After retiring, he taught graduate aerospace engineering at George Washington and North Carolina State universities for 21 years. He currently serves as Langley Professor Emeritus at the National Institute of Aerospace. Although he had a very satisfying, multi-faceted research career at NASA, he considers the pinnacle of his engineering career to be teaching and doing research with some truly outstanding graduate students. He would like to thank them for everything they taught him and for sharing a few years working together. He hopes his contribution will increase the robustness of the TBP program at Virginia Beta. 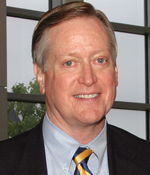 Dudley White, Virginia Alpha '76, Dudley spent his career at Zeta Associates, founded in 1984, which is in the field of signal collection and processing. When he joined as the 18th employee in 1987, Dudley was the second youngest there; currently, the company is about 400 strong. 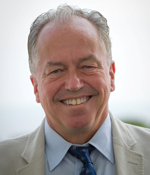 Peter Wright, New York Delta '75, Peter received a B.S. in chemical engineering and an MBA from Cornell University. In December 1990, Peter established P.A.W. Capital Partners, L.P., which now has approximately $200 million in total capital under management. As the general partner and portfolio manager, Peter is responsible for the management of his U.S. Equities Hedge Fund. Peter's primary interest is investing in organizations that promote STEM because while there are many worthy causes, he feels that the U.S. will be best served in the long term by creating more scientists, mathematicians, and engineers. "I tend to invest in organizations and prefer to fund endowments. Tau Beta Pi represents the best and brightest engineers. By identifying the top students and recognizing and honoring their achievements, it's a star on their resume. This might help them as they launch their career and inspire them to not only be more creative but also to create more intellectual property."